Jelgava have begun the preparations for one of the most important and extensive events in the city – International Ice sculpture festival, which will occur in Jelgava from 9th until 11th of February. 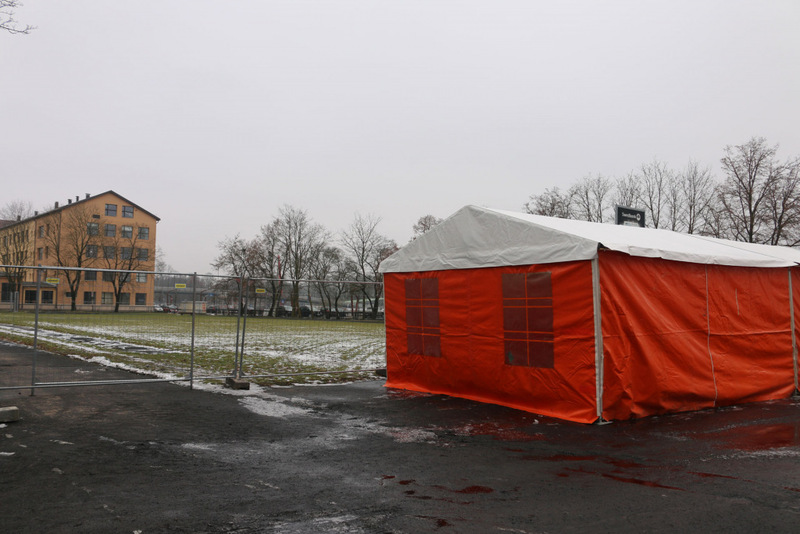 Tents already have been placed as well as work stations have been prepared in Pasta Island and LLU stadium, for the sculptors who will arrive in Jelgava on 4th of February. Furthermore, in Duke Jacob’s Square near to the trade sector houses white sheds have been placed, where more than 10 smaller and a large format photo objects and will be. Also the fence have been installed in Duke Jacob’s square, where on 4th of February construction of the ice labyrinth and two slides for children will begin. 8 tents have been placed on Pasta Island. There sculptors will make 15 large ice sculptures in pairs. To ensure easy viewing of sculptures, they have been placed in 8 different locations on Island. Ice sculptors – Inese Valtere, Valdis Valters and Donatas Mockus (Lithuania) – are continuing their work on “Koskenkorva” ice bar on Pasta Island. This is only one of 65 objects that will be made of ice in 20th International Ice Sculpture Festival in Jelgava and keeping in mind the quantity of the ice, this will be the largest sculpture of the Festival. Citizens of Jelgava city will not be able to visit Pasta Island from 4th of February until the opening night of the festival. As of right now fence have been placed also in LLU stadium on Janis Cakste Boulevard, where on Monday, February the 5th, the ice sculptors will begin their work on individual ice sculptures. For citizens the stadium will be available again on 13th of February. 20th International Ice sculpture festival will occur in Jelgava from 9th until 11th of February. This year taking part in the festival are 33 sculptors from 10 countries: Latvia, Lithuania, Russia, Ireland, Portugal, Norway, Netherlands, Ukraine, and China.